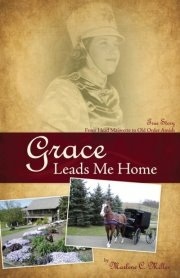 Hi, I’m Cathy, Marlene’s friend who helped her write her book,Grace Leads Me Home. I just got off the phone with Marlene and she is just thrilled with all the comments from everyone on this site. It’s wonderful to her that out of her conviction that God wanted her to write down her story for her family and others to read, so many are blessed and enjoying reading about her journey. She is excited to see who will win the drawing for the books. Congrats to Andrew and Patsy. Send a mailing address to me at ewesner@gmail.com, and I’ll pass it along to Marlene so she can send you your book. After we had been farming Wayne’s place for three years, in the summer of 1971 I started having misgivings about my abilities as an Amish wife and mother. Johnny was still farming and working days at the window and door plant; and we had six children, two in diapers, which began to overwhelm me. My workload was at its peak in the middle of canning season, and I was in a family way again and probably run down, physically and emotionally. The other Amish wives seemed to be an ideal of industry and kindness I could never live up to. Then when I was called lazy by an Amish relative, it really hurt me deep down to the core. I had tried very hard to be a dedicated Amish wife and mothers, had spent several years studying and learning this life, and I knew absolutely in my spirit that the Lord wanted me to be Asmih, but I diddn’t know how I could go on any longer. For about two weeks, the feelings of being overwhelmed just consumed me. Outside I had sows and pigs to feed and 100 chickens to tend to besides collecting and washing the eggs. Inside, I had three babies in cloth diapers, which I had to wash-no Pampers for us. Then there was the continual washing, cleaning, sewing baking, ironining-back then I ironed all our everyday clothes besides our church clothes-meals to make, bathing of children, and always dishes and dishes and dishes to wash.
It’s not that Johnny didn’t help me when he could, but with farming morning and nights at our place and Wayne’s and working eight hours at the factory, he could only do so much. I still brag about how many dirty diapers Johnny rinsed out in the toilet and then rinsed in the sink before I washed them on wash day. Sometimes when he came home at night, I had whole piles of dirty diapers waiting to be taken care of. Johnny would look at them and say, “I will do this.” And he took them, rinsed each one in the toilet, rinsed it again in the sink, and hung it to dry either on the side of the bathtub or the rinse tub in the basement. If we didn’t hang them to dry those diapers would mildew by wash day. Not only were the diapers piling up, but my feelings of being overwhelmed were piling up, too. It wasn’t that I wanted to leave being Amish or leave Johnny, but I just couldn’t cope any longer. I even began thinking, “My mom was right. I can’t handle this life anymore.” One gloomy day with overcast skies, I sat down and wrote Johnny a note, my mood as glum as the weather. I told him that I really loved him and the children, but I couldn’t go on any longer with the overwhelming responsibilities; I just had to leave. I even said I would wear my Amish clothes and believe my Amish faith, but mentally I couldn’t take my life any longer. I had my leaving all planned…. The price is $14.99, plus 3.00 shipping. Ohio residents add 6 1/2% tax. She accepts check or money order, and yes, she will autograph her book for you. Her phone is 866-660-2332. The address: Marlene C. Miller, 9082 Cement Bridge Rd., Dundee OH 44624. Marlene said she will gladly send you a book; she will gladly send 2 books if you want! The excerpt from the book is heart-wrenching! I can really feel Marlene’s desperation. I’ve started to read this book on my Kindle. It’s a great book and you all will enjoy it. Congratulations to Andrew & Patsy! The exerpt is gripping, and I’m glad I went ahead & ordered a copy. Thanks again for the giveaway. Have a great day! My book is available on Amazon as an E-book only. A person can order [hard copy] from Faith View Books (Millersburg, Ohio), Gospel Book Store (Berlin, Ohio), Gospel Shop (Sugarcreek, Ohio), or direct from me at Marlene C. Miller, 9082 Cement Bridge Rd., Dundee OH 44624. I want to let you know about another opportunity to win Marlene Miller’s book, Grace Leads Me Home, at another website, www.sherrygore.com. The deadline is Wednesday, August 22, 2012. If you are interested in the giveaway from guest author Marlene Miller, go to http://www.sherrygore.com/blog/blog/contest-winner-announced-and-a-new-guest-author-post. At that post, you’re supposed to say what your favorite fruit dessert is.